Just south of downtown Denver, the Old South Pearl Shopping District is a nine-block strip of specialty stores, restaurants, art galleries, and Victorian houses that stretches from Buchtel to Jewell Avenues. 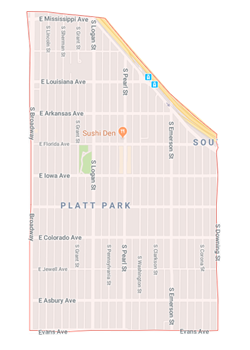 It is one of the most popular and distinctly historical shopping districts in the city of Denver, making Platt Park a highly desirable neighborhood for home buyers. Once the spot where the first trolley cars in Denver tracked through the city, the South Pearl Street neighborhood features some of the best shopping in the city. Tree-lined blocks invite shoppers to explore the century-old architecture and one-of-a-kind local stores on foot. Even though the neighborhood is home to high-end boutiques and some of the best nightlife in Denver, what makes Old South Pearl special is its old-fashion charm.This Denver neighborhood feels like a small, docile town in the Midwest. Known by locals as the "Heart of south Denver," South Pearl's old trolley cars have been replaced by the light rail system that runs through the neighborhood, making it easily accessible for biking or walking outside. You'll find more than 30 stores, several art galleries, and some of the best dining in Denver. If things start moving a little fast for you in the city, a quick trip around the block will take you back to a time when things were simpler. Old South Pearl is also a great place to catch live music during the summer and at seasonal events, including Blues & Brews. Additionally, the neighborhood features a very popular farmers market on Sundays from June through October. The Denver Folklore Center, which focuses on new and used instruments like guitars, banjos, and mandolins, has called the Old South Pearl neighborhood home for years after finding a niche in a place with as much history as its instruments.